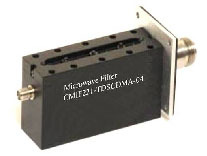 Corry Micronics offers custom and off-the-shelf cavity Bandpass filters for 900 MHz Communications Systems. The new line of Bandpass filters are designed to cover the spectrum from 902 to 927. These four cavity filters offer superior rejection with very low insertion loss. CAD Drawing: Cavity Bandpass Filters.